1. EMAIL IS THE BEST WAY TO CONNECT WITH YOUR CUSTOMER. Yes, it is because you can do a lot more with email than you can with social media. Most importantly, through segmentation you can target different messages to different types of customers. You can also control the number of emails you send out to each customer so that you do not annoy your contacts enough for them to hit the unsubscribe button. 2. GET YOUR CUSTOMER'S PERMISSION. By asking your customer for their email address, you should also tell them what you plan to use their email for. This way, you are asking their permission to stay in-touch. More importantly, getting their permission will mean that they will be less likely to hit the unsubscribe button. 3. KNOW YOUR CUSTOMER AS AN INDIVIDUAL. By connecting with your customer on an individual level, you have greater opportunity to build loyalty by getting the customer to feel that he/she is not on another generic mailing list. Your have an opportunity to personalise not only the format of the email -- but the content and offer as well. 4. EMAIL IS A GREAT WAY TO GET FEEDBACK. At the end of a nice dinner, most guest will not like to be interrupted with a survey form. But by offering a small reward (like a discount voucher), you can get some thoughtful and genuine feedback from your customers. 5. EMAIL CAN GO VIRAL AS WELL. Most people think of YOUTUBE and social media going viral -- email can too. Since email is more personal, if it is sent by a friend or someone you know, it is more likely to get more attention. My social media is so full of posts that I cannot possibly keep up ... but I still open emails from friends. At the end of the day, remember that the value of your business is not only what you sell, but also your loyal client list - sometimes known as your customer life time value but only if you can keep them coming back. Rememebr, it is all about INBOUND, not SPAM!!! 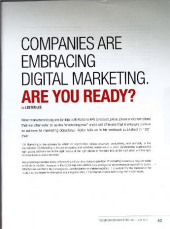 The Singapore Marketer Apr-Jun 2013: Companies Are Embracing Digital Marketing. Are You Ready? More and more companies are embracing digital marketing and creating demand for digital marketers. Are you ready? Download Your Free E-Mail Checklist! 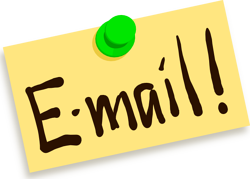 If you are not sure if your emails are Inbound or Outbound, this is the Checklist for you! A handy checklist to make sure you are creating emails "your customer love". 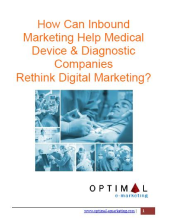 Is Inbound Marketing relevant for Medical Device & Diagnostic marketing? If you are in Medical Device and Diagnostic marketing and are wondering if Inbound Marketing can help you, this is the e-book for you! The objective of this blog is to educate and share opinions and ideas, and it is the intent of the editor to present the facts and data accurately. If you notice any errors, omissions or factual inaccuracies, please send the editor a note at: lestrlee@optimal-emarketing.com. If you would like to contribute an article or two on our blog or would simply like to chat live, kindly drop me an email. Thanks.